Nothing says springtime quite like spring’s favorite flowers- daffodils, tulips and lilies. These beautiful flowers are a great way to liven up any garden and bring some beautiful and vibrant blooms to your garden. All of three of these spring favorites are bulbs. Bulbs are a great choice for the novice gardener because they are easy to grow and they multiply quickly. Bulbs automatically divide and regenerate. This means that you can easily double or triple your supply of bulbs in just a couple of years. If you are growing bulbs in your garden they will need to be split every two to three years to keep your flowers looking their best. In fact, the blooms will even help you remember when it is time to divide the bulbs. If you notice that your blooms aren’t as abundant in the spring, you will know that it is time to divide your bulbs come fall. Wait to divide your bulbs until the early fall. Wait to divide your bulbs when the flowers have died and the green foliage starts to wither and die. Cut back any remaining greenery and wait about a week. Then carefully dig around the bulbs. If you use a large shovel it is very easy to accidentally cut or slice the bulbs with the shovel blade. Instead, use a hand shovel or trowel to gently loosen the dirt around the bulbs until they can be easily removed. You will find that the single bulb you planted will now be a large clump of several bulbs. Dividing is actually very easy. All you have to do is pull apart the bulb clump to create smaller individual bulbs. These bulbs are now ready to plant again. Simply place them individually in small hole with the point of the bulb facing up and root portion down. Cover the bulb with soil. They should be ready to grow and bloom again come spring. Many people confuse bulbs with other types of blooming plants including those that grow from corms, rhizomes and tubers. While these can all be divided, the process is a little different than when dividing a true bulb. Corms, like the crocus, look a lot like bulbs, but act a little differently. You can still separate these using a similar process to bulbs by pulling apart the new sections and replanting. Tubers, like dahlias and begonias, need to be cut into pieces. Clean the tuber off with fresh water and cut into sections. Each section will need at least one eye, or growing point, if you want them to take root. Finally rhizomes, like iris will have natural breaking points where you can simply divide the rhizome into pieces and replant. Bulbs are a great way to add color and beauty into your spring and summer gardens easily. Remember watch in the spring and when your blooms start to look a little sparse, it is time to divide in the fall. Always divide your bulbs in the fall to ensure that you don’t miss out on any beautiful blooms and that your bulbs have plenty of time to establish themselves before the cold winter strikes. Gabriel Meriwether is a writer for Brookside Patio Furniture which specializes in wicker patio furniture. Perennial flower beds can be considered as a basic component of a well-planned landscape design. They not only complement any garden, but are also easy to maintain. With perennial flower bed plans, you are not required to replace plants frequently, which is so in case of growing annuals and biennials. Once a perennial garden is established, you can follow simple maintenance tips to preserve the aesthetic value of the garden. The color and flower type of perennial plants are plentiful; you can select specific varieties as per your flower garden theme. 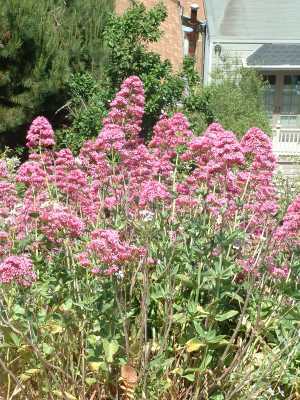 As we already know, the blooming period of perennial plants are short, usually 4 – 6 weeks. A properly planned perennial garden will give you the advantage of enjoying vibrant flowers throughout the year. While designing garden flower beds of a perennial type, make sure that you plan properly regarding the theme, beds and plant variety. Though perennial flowers can be grown randomly, plantation in beds gives a special visual impact. When viewed at a glance, vibrant colored flowers appear more beautiful when they bloom in groups, rather than in singles. Anytime, a perennial garden bed with full bloomed flowers is appreciated by every viewer. You can practice basic landscaping ideas for flower beds while designing a perennial garden. Following are some basic tips on perennial flower beds and designs for garden flower beds. Perennial Garden Theme: First of all, select the theme of the perennial garden. You can opt for a formal type, scented type (roses and lavender), butterfly garden (salvia and buddleia), water garden or any other theme as your choice. If you are a beginner, it is always better to choose a manageable and attractive perennial garden type. Once you gain knowledge about the maintenance tips regarding various themes, you can go for more complex garden types. Perennial Flower Bed Plan: Lay out the plan of the perennial flower beds according to the area of the yard. A wider bed gives more flexibility for designing the flower beds. Also, narrow flower beds give a crowded appearance. Nevertheless, too wide garden beds may be difficult to manage, as you will not be able to reach the middle plants. An 8 – 10 feet wide bed is a preferable dimension for perennial flower beds. Selecting Perennial Flower: Selecting the plant variety is the most crucial step for designing a perennial flower garden. A basic tip is to select plants according to their required growing conditions (soil, light, water, temperature) so that they grow best in your garden. Another important aspect for selecting plant variety is the height, flower color, length of blooming and flowering time. Creating Color Scheme: You can sort out the plants according to the height, flower color and blooming time prior to creating a color scheme. Also, make sure you consider the light requirements of the plants, while grouping perennial flowers. Speaking about the color scheme of the perennial flower bed, you can group perennial plants (of different colors) in odd numbers. A cluster of three perennial plants with various colors looks appealing. Warm flower colors include yellow, orange and red together; while cool colors are white, pink, purple and blue. Plantation Pattern: While growing the perennial plants, place the short varieties (dianthus and phlox) on the front and tall plants (peony and iris) at the back. You can include 14 – 18 inch tall flowers in the front section, 1 – 3 feet tall varieties in the middle portion and 3 – 5 feet perennial flowers at the back. Planting in this pattern will create a scenic beauty to your perennial flower beds.